James Armstrong was born in Toowoomba on 19 March 1885, the elder son of John Andrew Armstrong (1860 – 1935) and Margaret Ann née Thursby (1860 – 1943). His parents had married in Scotland and embarked from Glasgow in 1883 on board the ship Linlithgow with their two small daughters, Mary and Elizabeth. Sadly, Elizabeth a baby died during the voyage and was buried at sea. On arrival in Queensland Mr J. A. Armstrong joined the Queensland Railway Department at Toowoomba where their two sons, James and John Andrew (junior) were born. In 1892 the family moved to Red Hill in Brisbane where their youngest child Agnes Sarah was born. Mr Armstrong became a senior mail guard and retired in 1932 after a career lasting 48 years in the railway department. 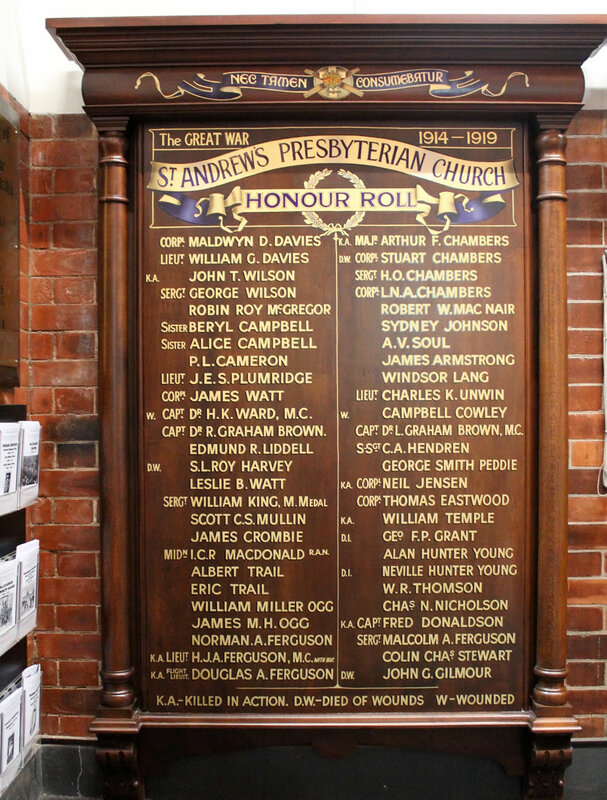 Mr and Mrs Armstrong and their family attended Saint Andrew’s Presbyterian Church and Mr J. A. Armstrong served on the committee of management. The first to marry in the Armstrong family of two girls and two boys was John Andrew (junior). In 1913, he married Jessie Ella McNaught, sister of Captain John Frederick McNaught MC1, in a ceremony in her parents’ Toowong home, conducted by Rev. W. H. Lewis, minister of Wharf Street Congregational Church. Mary who had migrated with her parents from Scotland in 1883 and had become a telephone operator and Agnes, a music teacher, did not marry. James Armstrong, a clerk, was still living at Half-Morton, the family home in Cambridge Street, Red Hill when war broke out in August 1914. He was 31 years and 6 months old and without any previous military experience when he enlisted in Brisbane on 16 October 1916 to serve overseas in the Great War. Given regimental number 35506, Gunner Armstrong was allotted to 14th reinforcements for the 13th Field Artillery Brigade at Liverpool, New South Wales on 6 March 1917 and his unit embarked from Sydney on board HMAT2 Miltiades on 2 August. The troops disembarked at Glasgow on 2 October and entered Reserve Brigade Australian Artillery (RBAA) at Larkhill Camp and Heytesbury, an Artillery training base on the edge of Salisbury plain. At the beginning of April 1918, they transferred to the Australian General Base Depot at Rouelles and joined the 1st Divisional Ammunition Column (DAC). Its role was the provision of ammunition to the forward gun positions. The nature, range and effect of artillery fire during the war dominated the battlefields of the Western Front. To sustain this effect, the logistics of supply of ammunition was critical. The supply chain from manufacture through storage, distribution and provision to disposal of unexploded ordnance and recovery of re-usable components had to be maintained. Keeping ammunition up to the guns at the rates required was made more difficult by the weight and volume of the artillery ammunition. It was a mammoth task to keep ammunition up to the guns by moving it from “Third Line” storage up to the “First Line” at the Front. It involved motor and horse drawn transport, heavy and light rail and tramways. Ammunition dumps and transport near the Front Line were high priority targets of the enemy’s guns and aircraft. Gunner James Armstrong carried out his assigned tasks in this dangerous and risky process till the end of the war. His service record notes admission to hospital in Rouen for treatment for an abscess on his right heel in December 1918 and assignment to various duties in France in the early months of 1919. He obtained non-military employment at Bradford Technical College in England where he completed satisfactorily a course entitled Wool Classing and Wool Textile Trade from 11 April to 22 July 1919. The course fee cost £3/3/- (three guineas = $6.30) and James Armstrong was paid 6/- (six shillings = 60 cents) per diem plus a daily subsistence allowance of 6/-. James Armstrong waited a long time for his return voyage to Australia. He left England on the Euripides on 3 September 1919, disembarked at Sydney on 24 October and was discharged from the AIF at Sydney on 24 November 1919. Back in civilian life, James Armstrong worked as a salesman and traveller in New South Wales. He married Dorothy May Vincent at Burrowa in 1922. They lived with their family of two children in the North Sydney suburb of Balgowlah and during the Second World War James Armstrong served in the Army Citizen Military Forces in North Sydney. James and Dorothy later moved to Warringah, a northern beach suburb in Sydney. James Armstrong’s death was recorded in the Chatswood District of North Sydney in 1961.